Subscription boxes: A selection of your favorite kinds of items mailed right to your door. Subscription boxes have gained an immense amount of momentum over the years, much to the delight of customers and small business owners alike. Oftentimes, when we think about a subscription box service, we think about it from the customer side. But what if you're a small business - say, a small pagan or witchcraft business - wanting to get your feet off the ground and running? Owning a small business in the pagan world is no joke. It takes hard work and dedication. Millions of brick-and-mortars pop up every year and fold under the pressure. Sustainability is difficult when you're reaching such a niche market. 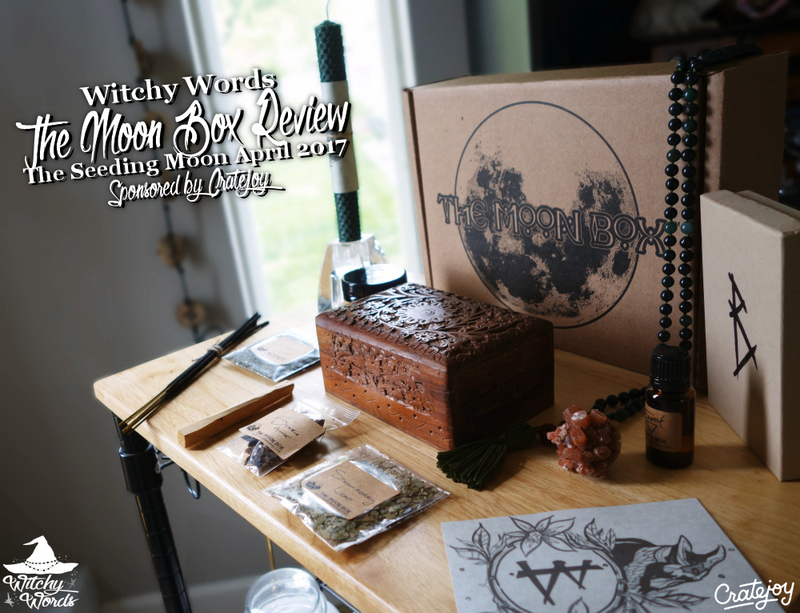 To small pagan and witchcraft business owners, I have just three words for you: Subscription box marketplace. That's how Cratejoy describes their service, but it's so much more. Access to thousands of subscription boxes and an easy-to-use search bar are just the tip of the iceberg when it comes to the perks that Cratejoy offers. As a small business owner, you can easily and securely start your very own subscription boxes, reaching a whole new set of customers every month. Pretty handy! When Karen at Cratejoy asked if I would be interested in reviewing subscription boxes offered through their website, I didn't just think about it from the customer side. As a small business owner, I know how tough it is to reach your audience. Subscription boxes are a great way of selling your product, reaching your target market and creating a stable income. Pagan business owners, take note! One such business doing just that is The Moon Box. Unlike other subscription boxes catering to the sabbats, The Moon Box specifically looks towards each full moon, providing witchcraft-based supplies right to your doorstep for your next esbat ritual! According to their website, you will receive a consistent set of items along with 1-2 large featured items and a sabbat gift each month a sabbat is included. Each box comes with a lengthy list of supplies and their correlation to the moon at hand. The pamphlet also contains a description of the full moon as well as the upcoming sabbat if applicable. So let's dig in and see what we've got here. Immediately on top is this gorgeous art card for your altar. Because the theme of the April esbat was growing, the rune Berkano plays a huge part in this box. This altar art includes a crow, which represents change, and of course flowers and leaves for growth. Also on top were two herbs: Dandelion and strawberry leaf. Dandelions are plentiful this time of year and are useful for divination and wishes. Strawberries are seasonal and are great for both luck and love. Suggestions for these herbs according to the packet include sachets, loose incense and ritual baths. A half ounce of earth oil, a blend of cedar, bergamot and other oils, is perfect for growth and grounding. As noted in the pamphlet, the oil is charged with white sage and a quartz crystal. I appreciated knowing that this oil wasn't just blended but properly charged. It's a special touch I feel is sometimes missing from other products. Digging further, we find 4 ouncez of sacret salt. The Incrementum blend was brewed with cedar, vanilla, myrrh and white sage along with their "earth" oil.These are perfect bath salts but, of course, pay attention to any allergies you may have. Safety precedes witchy! Six sticks of forest incense was included, which was particularly appropriate for the earth theme of this box. This amazing rolled wax is, well, amazing! Also, without giving much away, the description from the pamphlet and the spell included with the candle makes it clear that those behind The Moon Box aren't just trying to sell you supplies: They're also using these supplies in their own work. What you're receiving is a piece of their craft, a glimpse into their Book of Shadows and a compiled box for an esbat ritual. This isn't just sponsored products but a well-orchestrated supply box. Something to take note of as we continue! The next item I ran into that knocked my socks off was this impressive hand-knotted intention necklace made with jade, jasper and rudraksha beads. You know it's real because this thing has weight. Without giving too much away, this gorgeous necklace is perfect for focusing your intentions during transition. And, while the box was made specifically for the necklace, its beautiful simplicity makes it fantastic for ritual or altar use as well. 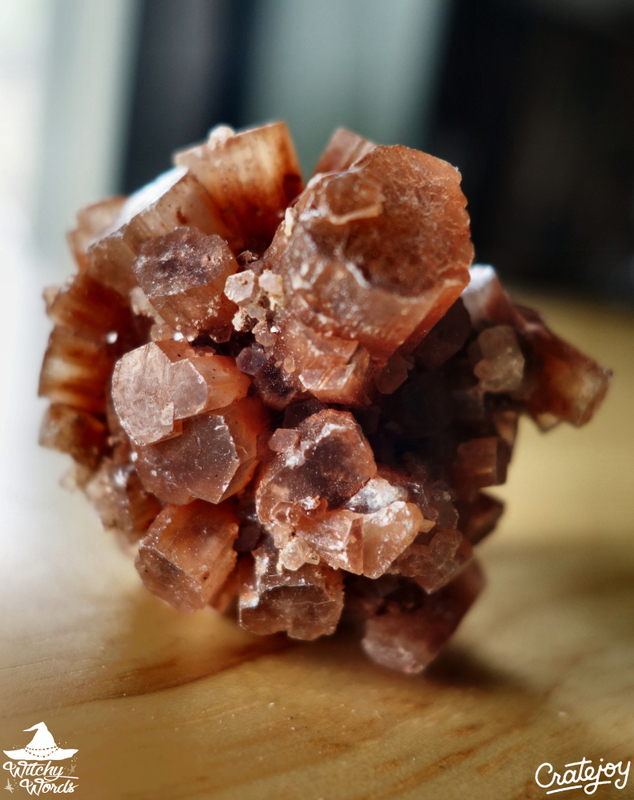 There's this absolutely gorgeous aragonite star crystal, a stone that is stated in the pamphlet to assist in exploring higher realms. This thing is just... ugh, it's so beautiful. Words don't do it justice, so here's another picture. This crystal isn't small either. 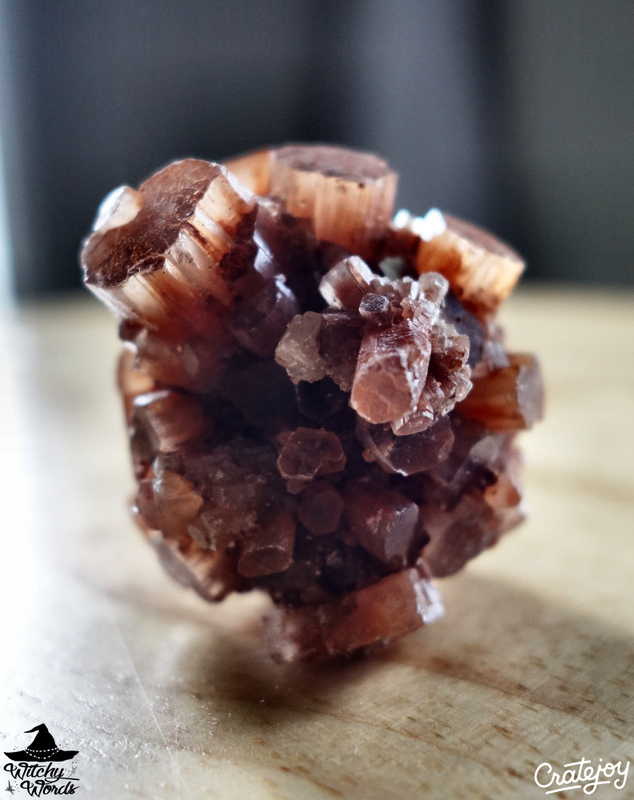 I wish I had a penny so you could gauge the size but trust me when I say it is a gorgeous large chunk o' crystal. This is a hand-carved floral box with the Berkano rune burned into the underside. And that's not all it is. Inside the box, I found palo santo, a cleansing and healing wood, and star anise. The pamphlet suggests using the star anise as an offering, but of course you can use it anyway you like if that doesn't suit you. In addition, the box was filled with moss. While some of these items were included inside the box to save space I'm sure, you could easily cleanse the box with the palo santo and place the star anise inside on your altar as an offering to the season. The pamphlet suggests using the box to charge items and tools by placing them inside and visualizing the light surrounding them. I was highly impressed with The Moon Box for a variety of reasons. Here's just a few! This box was extremely cohesive and every item hit the internal theme. Unlike many subscription boxes which include a conglomerate of varying items that may or may not connect well together, it's clear that the creators behind this box are actively practicing, that they're involved with every piece of the box and that each piece plays an essential role to creating an overarching ritual. I can't say that I've seen that before from other subscription services. Most subscription boxes run between the $35 and $45 USD range but the items you get out of it sometimes delight and sometimes disappoint. This isn't so with The Moon Box. I was immediately impressed by the number and quality of the items included, and the number of hand-made, one-of-a-kind products. I have a feeling that I would rarely feel let down by the caliber of witchcraft tools supplied in each box if I were to subscribe myself. How do I know? Because you can view their previous boxes here and, sure enough, each one impresses me as much as this one did. Two pages included in the box detail everything the subscription box contains, correspondences for each item and suggestions for how to use it in your ritual. Beginner witches can take the guess work out of ritual planning and advanced witches will appreciate not having to deal with the complexity of planning a worthwhile and workable ritual. The only thing the pamphlet leaves me wanting is sources of the items included. Who are your suppliers? Are you working local? Are you working organic? While I don't want the owners behind The Moon Box to have to give everything away, I've been spoiled with transparency in other boxes that I wish I had here. That being said, you'll note that I'm still counting the info pamphlet as a plus. It's a small nitpick for such an amazing box. Are you interested in signing up for the next Moon Box? There's no wait! Simply click here and sign up today! I can see why this box was a must-have on Cratejoy. It's such a delight! And Cratejoy itself? A marketplace that can help pagans and pagan-owned businesses meet? That's the kind of marketplace I like to see. Very awesome! Thank you for the information. I plan to try this box for myself!! Thank you so much, Phaedra! Looks like you got some great items! Its an expensive box though, which has kept it off my list of subscriptions to try. I can't afford $45 a month. It would be nice if this one has tiers like many other pagan subscription boxes. This is one of only a handful that doesn't offer something cheaper. While I tend to like tiered subscription boxes, I feel like this is one that simply cannot be plucked apart into cheaper tiers. The entirety of the box creates a followable and thoughtful full moon ritual. In that case, it makes it well worth the price. Great stuff! I Always love reading your blog. Your stuff is always so comprehensive and thorough. Thank you so much, Kolika! Wow!! Everything in The Moon Box looks divine but I'm really, really digging the artwork. The Crow and Berkana rune together have an unexpected synergy that I'm very much appreciating. Thanks for sharing your Cratejoy with us!! Absolutely one of my favorite prints included in a box ever. Thank you so much, Tamilia! This looks like a lovely subscription! That crystal and the box are just gorgeous! I especially like how they combined the full moon and the upcoming sabbat in one box. I may have to check this out further. Well done on the review as well! Thank you so much, Liz! I was very excited to see this box and I certainly wasn't disappointed. If and when I garner some spare funds, this is going right on my list of subscription boxes I NEED in my life.